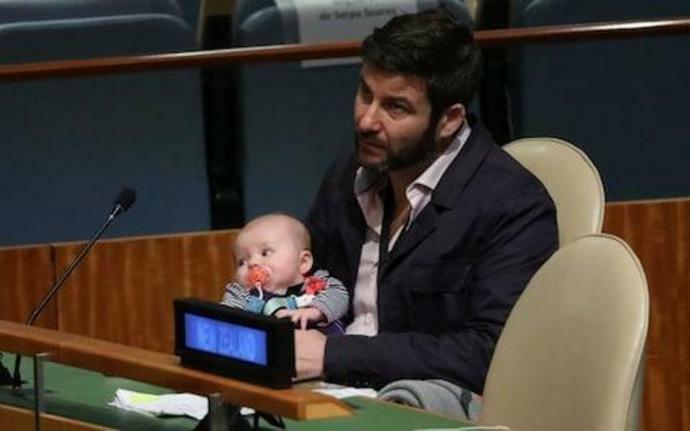 New Zealand's so-called "First Baby" - the three-month-old daughter of prime minister Jacinda Ardern - has made her debut on the international political stage, appearing at a peace summit at the United Nations with her mother. Ms Ardern kissed Neve Te Aroha before addressing the summit, during which the baby was held by Clarke Gayford, Ms Ardern's partner. "I wish I could have captured the startled look on a Japanese delegation inside the UN yesterday who walked into a meeting room in the middle of a nappy change. Great yarn for her 21st." Ms Ardern, 38, is her country's youngest leader and the first to take maternity leave. She is only the second leader in modern history to give birth while in office, after Pakistan's Benazir Bhutto in 1990. Ms Ardern said she and her partner made "a very practical decision" to take Neve with them into the United Nations summit in New York. "Neve is actually nearby me most of the time in New Zealand, she's just not always caught," she said. "But here when she's awake we try and keep her with me so obviously that was the occasion." A United Nations spokesman, Stephane Dujarric, said the organisation was delighted to see Neve in the General Assembly hall. "Prime Minister Ardern is showing that no one is better qualified to represent her country than a working mother," he said. "Just five percent of the world's leaders are women, so we need to make them as welcome here as possible." Ms Ardern has been feted by the United States media during her visit and appeared on NBC's Today Show shortly after her arrival. She joked that taking her daughter on a seventeen-hour flight "at the time felt on par" with running the country. "But between Clarke and I we managed it," she said. "You don't know until you are there of course, but [motherhood] has met my expectations, the joy though has far surpassed my expectations."